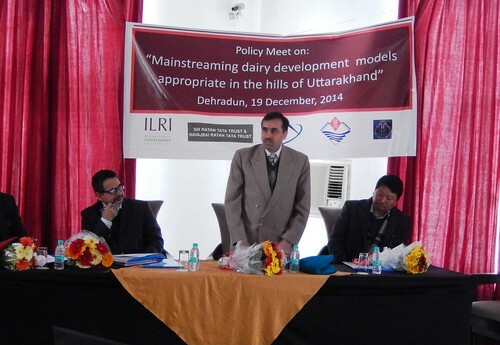 On 19 December 2014, a policy dialogue on ‘mainstreaming models for dairy-based livelihood improvement in Uttrakhand’ was organised by the International Livestock Research Institute (ILRI) and Himmotthan Society, the nodal agency of the Sir Ratan Tata Trust & the Navajbai Ratan Tata Trust. The policy dialogue was honoured by the presence of Dr Ranvir Singh IAS, the Secretary, Department of Animal Husbandry, Government of Uttarakhand. It was attended by various department officials, policymakers, international and non-governmental organisations, private-sector bodies, donors and development agencies. Community managed dairy in the hills (presented by Dr Rajendra Koshyari, Himmotthan). ILRI in its research found that the above five models impacted the target communities significantly and therefore efforts are needed to scale them up in more villages in the state. As dairy is a prime force in Uttarakhand’s economy, the sector still requires more attention in the policy framework. The aim of the policy dialogue was to mainstream the tested models using public resources so that the benefits reach the ‘last mile’ of development. After listening to presentation of all five models of dairy development appropriate in the hills, Dr Ranvir Singh suggested that the various models of dairy development field tested by ILRI and Himmotthan appear to be successful in the hills and therefore the State is interested to mainstream them through its apparatus. The policy working group members agreed to have their first meeting in mid-January 2015. This article was written by Peter Ballantyne, ILRI’s Head of Communications and Knowledge Management. Tags: ELKS, innovation platforms, Livelihoods, Uttarakhand. Bookmark the permalink.